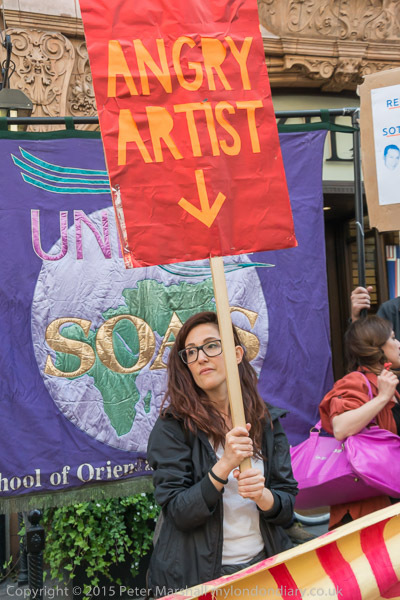 This will be a rather shorter post than usual (I hear murmurs of “Thank goodness” from readers) because I’m rushing to leave for an emergency demonstration called because Sandy Nicholl, SOAS Unison’s branch secretary has just been suspended by the SOAS management on grounds of gross misconduct. As in other such cases, the allegations made against him appear to be false and in any case would not be grounds for their action, but are simply victimisation for legitimate trade union activities that annoy the management. 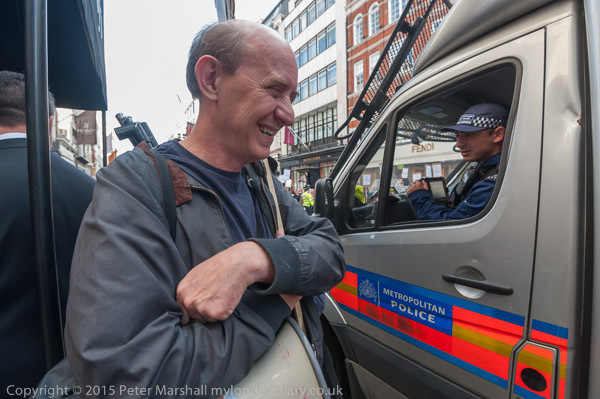 On the evening of July 8th I was taking pictures of a protest over another case of victimisation, where Sotheby’s had effectively sacked four workers for taking part in a legal demonstration calling for proper sick pay, holiday and pensions arrangements. As so often, the union involved, the United Voices of the World, was supported in its protest by other trade unionists, including other victimised union reps such as Candy Udwin from the National Gallery and Alan Brown from Bromley Council, and, as at many other such protests, by Sandy Nicholl with the SOAS Unison banner. Of course there were others giving their support to the UVW, notably Class War, who had brought their water pistols, megaphone and ‘We have found new homes for the rich‘ banner and infused the occasion with their usual theatricality. Others making their presence felt included some from Lewisham People Before Profits and OSE (Open School East) Artists. 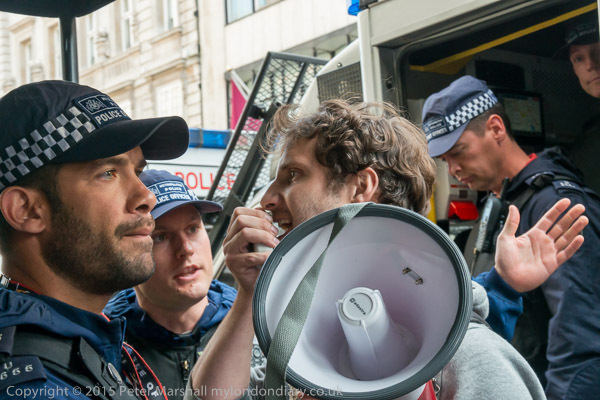 But at the centre were the UVW, and their General Secretary Petross Elia, standing up to some fairly extreme harassment by police who had obviously been leaned on very heavily by Sotheby’s and their influential friends to try and counter the protest rather than – as they should – facilitate it. It’s a line on which police almost always favour the rich and powerful. 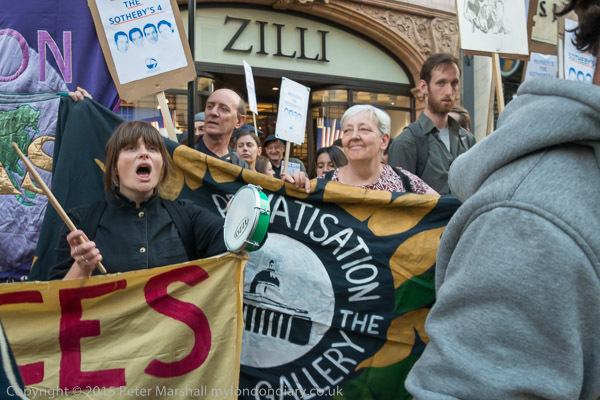 One of the placards which you can find if you search the images at Sotheby’s 4 sacked for protesting I think sums things up nicely; the text reads ‘Your worker’s rights are bad for my business! !’ But they are rights enshrine in law and the law should prevail, and in this case, eventually after some further months of struggle it seems as if here and at the National Gallery it has. Now I’m off to SOAS to see more people standing up for the law. This entry was posted on Thursday, October 29th, 2015 at 11:15 am and is filed under My Own Work, Political Issues. You can follow any responses to this entry through the RSS 2.0 feed. You can leave a response, or trackback from your own site.